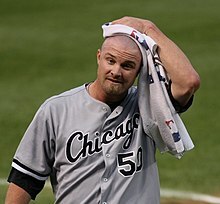 John William Danks (born April 15, 1985) is an American former professional baseball pitcher. He played in Major League Baseball (MLB) for the Chicago White Sox. Danks graduated from Round Rock High School in Texas in 2003 and was named the co-central Texas player of the year that season. Danks was drafted in the first round, ninth overall in the 2003 Major League Baseball Draft by the Texas Rangers. His brother, Jordan Danks, was his teammate on the White Sox from 2012-2014. Danks proposed to girlfriend, country artist Ashley Monroe of the Pistol Annies, on September 14, 2012 after Monroe finished the Annies' first show of their headlining tour. They were married on October 24, 2013. As a top prospect for the Chicago White Sox in 2007, he was selected as the team's fifth starter in their rotation. The 72-90 White Sox provided Danks with little support in the first half of the season; he was 5-6 with an acceptable 4.62 ERA before the break. Down the stretch, Danks tired, and he was shut down for the year after a slow September start. Danks finished the second half 1-7 with a 7.11 ERA and the season 6-13 with a dismal 5.50 ERA in 26 starts. The White Sox opted to use Danks in the starting rotation again in 2008 and he did not disappoint. The second-year lefty pitched masterfully, ranking among the league leaders in ERA all season and taking no-hit games beyond the fifth inning on several occasions. Danks set career bests in nearly every major statistical category, finishing with a 12-9 record, 3.32 ERA (fifth in the American League) and 1.23 WHIP in 33 starts. Danks finished just short of the benchmark 200 regular-season innings, hurling 195. Making his first career short-rest start in the one-game playoff for the American League Central Division title, Danks defeated the visiting Minnesota Twins 1-0 with eight dominant innings of two-hit ball. The victory propelled the White Sox into the postseason. On December 29, 2011, Danks agreed on a five-year, $65 million deal, which took him through his final arbitration eligible season and his first four free agency years. Danks made $8 million in 2012 and $14.25 million from 2013-2016. On May 25, 2012, Danks was placed on the 15-day disabled list with a left shoulder strain. That injury turned out to be season-ending, as he had surgery on August 6 on his left shoulder to "explore and correct issues" found there. He was hoping to come back in late September, but instead opted towards having the surgery so he could be ready for 2013 spring training. In 9 starts with Chicago, he went 3-4 with a 5.70 ERA with 30 strikeouts in 53.2 innings. On August 25, 2013, Danks was the winning pitcher during a 5-2 victory over the Texas Rangers. During that game his brother, Jordan Danks, hit a go-ahead home run. According to Elias Sports Bureau, it was the first time since June 5, 1955, that a player homered in support of his brother pitching, when Kansas City catcher Billy Shantz homered in support of his brother Bobby Shantz. On May 3, 2016, Danks was designated for assignment after struggling early in the 2016 season with a 7.25 ERA after four starts. Danks signed a minor league contract with the Atlanta Braves in December 2016. He was released on March 20, 2017. Danks has a very live arm, and has a good four-seam fastball in the 90-92 mph range. His best strikeout pitch is a sharp cutter that comes in at 87-88 mph. Danks also has a very good straight change that he uses very effectively against righties at 82-84 mph. In addition, Danks has a big, slow curveball in the 76-77 mph range that he can throw early in the count to get strikes. He also fairly frequently throws a two-seam fastball. Danks throws with an over-the-top delivery. ^ Davis, Danny. "Diamonds are for her brothers, but Danks also a gem" Archived 2007-11-28 at the Wayback Machine, Austin American-Statesman, October 30, 2007. During high school, he played for Andrew Prater's Austin Baseball Club (ABC) summer league team. "John Danks, who graduated in 2003, just finished his first complete season as a starting pitcher for the Chicago White Sox." ^ White Sox Press Release (December 29, 2011). "White Sox and pitcher John Danks agree to terms on five-year contract". whitesox.com. ^ Hayes, Dan (July 31, 2012). "Danks to have surgery, out for rest of season". CSN Chicago. Archived from the original on January 20, 2013. ^ Randhawa, Manny (August 25, 2013). "Danks brothers steal the show in finale vs. Rangers". MLB.com. ^ Kane, Colleen (May 4, 2016). "With focus on a 'special summer,' White Sox part with veteran John Danks". Chicago Tribune. Retrieved December 14, 2016. ^ Bowman, Mark (December 12, 2016). "Braves give Danks a shot to revive career". MLB.com. Retrieved December 14, 2016. ^ Bowman, Mark (March 21, 2017). "Swanson, Garcia return; Inciarte on hold". MLB.com. Retrieved March 21, 2017. This page was last edited on 17 March 2019, at 18:50 (UTC).